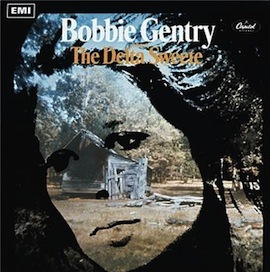 With its picture of the gorgeous Bobbie Gentry superimposed in monochrome over a fallen-down shack, The Delta Sweete promises the peculiarly Southern music that Gentry is known for. Released in 1968, it was Gentry’s second album, coming on the heels of the tremendous success of one of the most memorable, if bizarre, hits of the 1960s, “Ode to Billy Joe.” Like “Billy Joe,” Sweete is a loosely-formed concept album of sorts that further explores the vagaries of the Mississippi Delta. Here, Gentry evokes the county fairs and family reunions of her girlhood, along with the small, everyday moments that made “Billy Joe” such a classic. Delivered in the husky voice that’s Gentry’s trademark, “Okolona River Bottom Band” — a song concerning a southern talent show — is a veritable travelogue of the Delta region. It sounds like something from another era, or at the very least a lost track from one of the Band’s early albums. “Reunion” depicts a child’s experience at that most Southern of traditions, the family reunion, complete with gossip, hair pulling, and a finger stuck in a Coke bottle. And while songs such as “Penduli Pendulum,” “Courtyard,” and “Jessye’ Lizabeth” don’t lyrically reference the Delta country, they are musically evocative of the dog days rhythm of the American South. The album is rounded out with “Sermon,” “Louisiana Man,” and “Tobacco Road” — all well-known covers– that feel of a piece with the rest of the album, referencing the hellfire and brimstone of a country church service and the hand-to-mouth existence of sharecroppers and trappers. I have a hard time getting into music post 70’s but looking forward to checking this out. I am trying to branch out. Her voice is where it is at. Excellent. So timely. Bobby is a Southern Soul Belle.